, and other storms are sure to follow. As we did last year, we've created a "Hurricane Season 2009" folder under "Weather" in Google Earth. This folder contains data that allows you to watch the storms develop and follow their progress. Within this folder, you'll find hourly-updated storm tracks courtesy of the National Hurricane Center, which include forecasted storm center positions and storm track areas. The forecasted center positions of each storm are represented by hurricane-like icons and correspond in size and shape to the intensity and type of storm. The current position of the storm is shown, along with the predicted storm track swath, which is outlined in red. These are areas most likely to be affected by the storm at a given time 12-hour interval. Inside each balloon you'll find an overview of the storm, its official NHC advisory, a near real-time news gadget, and reference information. The 2009 hurricane season has begun. 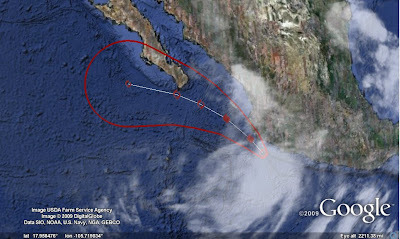 Tropical Storm Andres is brewing off the coast of Mexico, and other storms are sure to follow. As we did last year, we've created a "Hurricane Season 2009" folder under "Weather" in Google Earth. This folder contains data that allows you to watch the storms develop and follow their progress.